The Spring trekking season has faded and the monsoon season is in full swing bringing the inevitable delays and difficulties in getting around. The road between HART's two bases, the Muglin-Naryanghadi road, is in the process of being upgraded but is currently subject to many hours of delay and closure daily, with the situation exacerbated by the frequent rainfall and landslides. 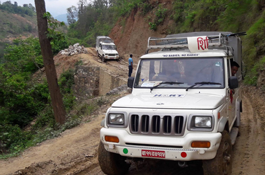 A major series of camps were held in eastern Nepal which were very much facilitated by the acquisition of a new 4WD Mahindra Bolero vehicle, sponsored by LUSH. The building extension is working well and the clinic is fully utilised by the Pokhara community. Unspayed females found during the Spring mass anti-rabies vaccination campaign have now been neutered, a total of just under 200. The clinic also continues to respond to calls for rescue and treatment of injured animals. This is Kanchi, so named because she is the youngest dog at HART. 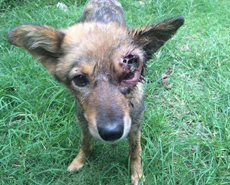 She has lost one eye and maggots were infesting her wound. After nursing and treatment, including spaying and vaccinating, she has been returned to her area where the local community have promised to look after her. 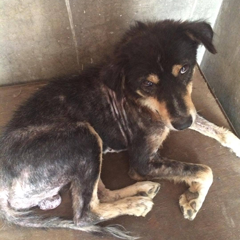 Suffering from a case of severe mange, 'Lutey' was rescued by one of HART staff. A month long treatment and he has been doing great. He has been returned into his community after neutering and vaccination. "Our school program focuses students of 5th, 6th and 7th standard. 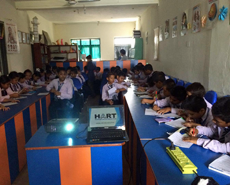 The students are informed about Rabies, its transmission and how to avoid being bitten by a dog. Furthermore, the children are taught about animal welfare; that all animals are sentient as we are. Around 650 students have participated and benefited from this program, organised at four different schools. 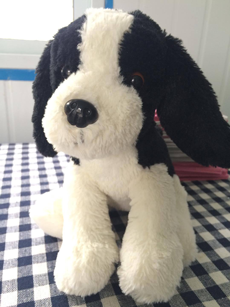 The children very much admired our mascot 'Momo' and were very receptive when Momo was introduced to demonstrate the different behaviours of dog such as happiness, fear, submission and aggression. The children were taught to identify a dog's attitude based on its body posture and behaviour." 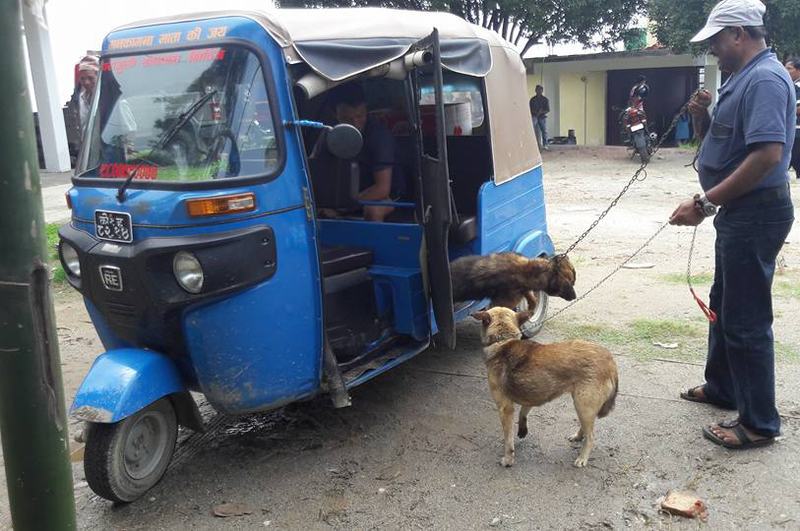 The clinic continues to offer treatment to animals in need throughout the town, and, as in Pokhara, is increasingly having to respond to calls to help sick and injured cows. 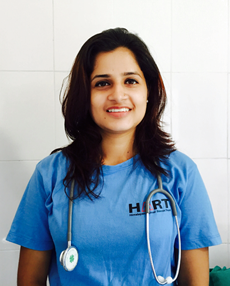 Dr Sajita Gyawali, a recent graduate of the IAAS, has joined HART in place of Dr Sanjiv Pandit and she will be HART's first lady vet. Also joining the team in Bharatpur is Ramesh Bhattarai. Ramesh was with HART from 2010 to 2011 when he left for pastures new. He is welcome back, particularly because of his gentle touch with dogs. A series of neutering and anti-rabies vaccination camps was held in the east of the country between June 4th and June 25th. All the HART team returned safely to their bases in Pokhara and Bharatpur after a journey of nearly 600 kilometres - though Prakash Chaudhari was delayed for some days by the breakdown of HART's oldest vehicle. The support of LUSH had earlier enabled the purchase of a new 4WD Mahindra Bolero which proved immediately invaluable on the trip. 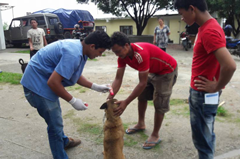 In total 540 dogs were neutered and 739 were vaccinated at the three venues of Dharan, Khadbari and Birtamod. Shanku Karna Shrestha (Pets Home, Dharan) for liaising with the Dharan Sub Metropolitan and organising the program in the city for four consecutive years. Dharan Sub Metropolitan for facilitating the programme. Dr Umesh Dahal, Dr Grishma Neupane and Dr Sita Rijal (DLSO Khadbari) for initiating this pilot programme in the district. 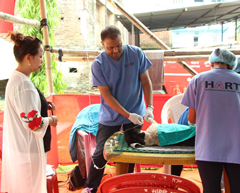 Mr Suwas Shrestha (Chief Executive Officer of Khadbari Municipality) for his continued interest in conducting a neutering programme. Mr Kumar Singh Khatri (DLSO Jhapa) for liaising with Birtamod Municipality and inviting HART to give continuity to the neutering programme in Birtamod for second year. Thank you also to HART supporters who have donated to purchase medical supplies for this satellite neutering programme. 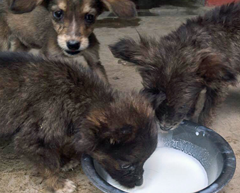 The most lasting achievement of this satellite programme is that the Dharan Sub Metropolitan has declared it will introduce a dog registration system in the city as well as operate a dog shelter. This initiative will be the first model project operated by a local authority in the country. 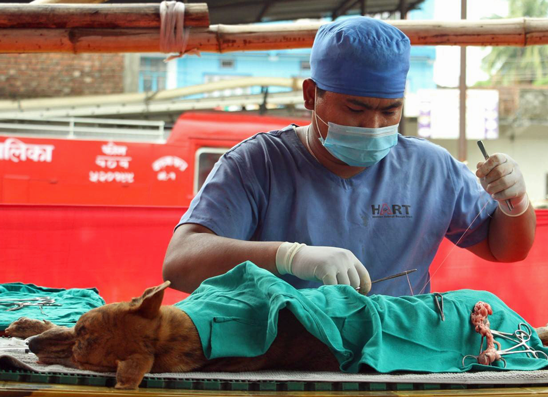 Rabies remains an endemic disease in Nepal. 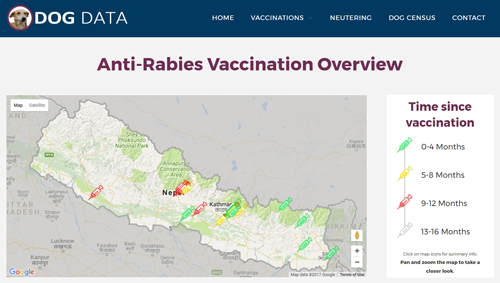 An essential part of any strategy to eliminate rabies is to vaccinate dogs, ensuring that at least 70% of the dog population in any given area is covered. Major dog welfare NGOs in the country have either added their vaccination data or are in the process of doing so. 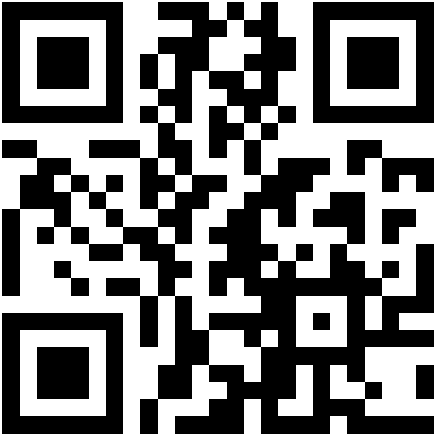 This website informs local communities, relevant authorities, researchers and international organisations about whether dogs in an area have been vaccinated, and if so, when and by whom. HART is continually grateful to long-standing supporters who contribute regularly over the years and ensure that bills can be paid and services maintained. 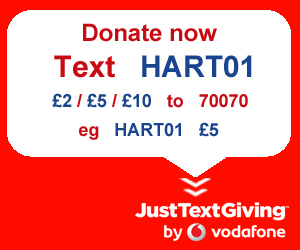 Unlike bigger organisations, HART has no administrative overheads so all funds go direct to the animals. 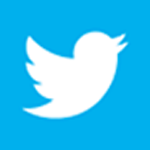 Thanks are also due to those who donate in memory of family members who had ties with Nepal. Pat and Mick Tyass, keen trekkers all their lives, were commemorated by Helen Dreyer and Sue Marais earlier this year.